My freelance business – Morgan Online Marketing (or MOM for short) – turned 5-years-old on Monday, as I officially took the plunge and went full-time freelance on Tuesday 7th May 2013, having left my last agency role the previous Friday. 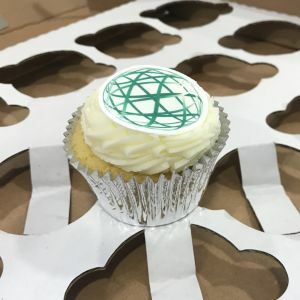 I celebrated with branded gluten-free cupcakes, like the one pictured. Yum. When you’re self-employed, you sometimes hear that infamous “#% of businesses die in their first 5 years” statistic, which seems to vary depending on who you ask (it’s anything from 20% to 50% apparently), so I’m chuffed to have passed (survived?) this particular milestone. I’ve posted on anniversaries before (here’s the links to the 1st, 2nd and 3rd years), but this time I just wanted to say a few thank you’s to people who have helped me along the way. Firstly, thank you to Max Minzer of Max Impact. As I was in the process of going solo, he produced some videos as part of his Max Impact series (a weekly series of Google+ Hangouts webinars, each covering different SEO/digital marketing topics) and the Choosing Clients one was massively useful. A big thank you to Lauren Hall-Stigerts and Mackenzie Fogelson for the advice that they dropped in that one. See also: Building an SEO Practice with Bill Sebald (another good one). Thank you to GO Wales. Although I’ve never utilised them in the way that most people have (either by being a graduate getting a job, or an employer getting funding towards a hire), they also used to run Freelancer Academies, week-long workshops that gave you an intro to freelancing life. I was very lucky to go on one in my second week as a freelancer. It was extremely useful so early on. A mahoosive thank you to Welsh ICE, which I joined within a month or two of going solo. All I was seeking was a business address, a desk, some coffee and WiFi – but I got so, so much more. The community up there is incredible. These aren’t just coworkers and fellow business owners – they’ve become good friends. Gareth obviously gets a mention because he introduced me to the place, but the current team (Jamie, Rachel, Huw and Llinos) are amazing. Thank you to Nichola Stott, MD of Erudite (formerly known as theMediaFlow). At a brightonSEO years ago, she offered one-to-one sessions giving advice to people looking to go freelance or start an agency. Despite not booking a slot officially, she was still happy to see me, and gave me some really critical advice about closing sales (which I still implement today). Thank you to State of Digital – to Russell O’Sullivan for suggesting me as a contributor, to Barry Adams for being my (extremely patient and supportive) editor, and to Bas van den Beld for running the show. It’s been great writing for the site. A big thank you to George Savva, my business coach. We met waaay back in 2010 at a networking event (back in my employee-at-an-agency days), and then years later I found out from someone that he offered one-to-one business coaching sessions, which I jumped at instantly. The advice he’s offered to me over the years has been brilliant. Thank you to my locally-based SEO buddies and former colleagues Andrew Isidoro and Ceri Harris, who I used to grab a beer with every now and again as a catch-up – which sort of inspired the idea for (and evolved into) Cardiff SEO Meet. While I’m on the subject, a big thank you to Kelvin Newman of brightonSEO and Mark Scully of Learn Inbound for offering me really useful advice over the years. It goes without saying that my parents – Bernard & Marilyn – deserve a shout-out… perhaps the biggest one. Running multiple successful businesses – including Computer Recruiter and LosLocosBeach.com – they have had an enormous influence on me, and were (and still are) extremely supportive towards me deciding to join them in the exciting yet terrifying world of self-employment. Thank you so much. I’ve likely forgotten a ton of people to add to this – apologies if so. So many have helped me on my journey. Thank you all. Oh and I’m going to MozCon 2018 in Seattle in July, as I actually bloody won the competition, based on my submission!